Home » News » What now for Ennis after the Fleadh? The crowd gathers on O' Connell Street to listen to buskers and sample the atmosphere during Fleadh Cheoil na hÉireann. Photograph by John Kelly. AS Fleadh Cheoil na hÉireann departs Ennis for Drogheda in 2018, plans are already underway to see what large-scale events will follow after the county town proved itself on the national stage. 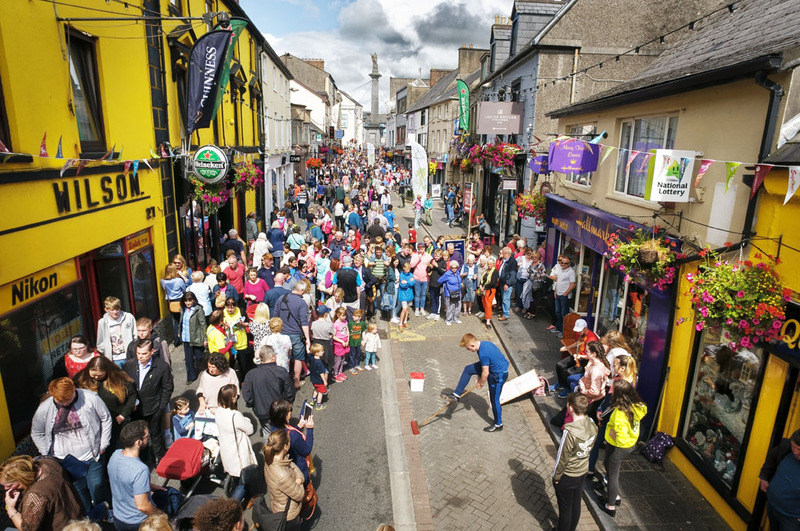 Ennis Chamber president William Cahir said he has already been involved in two meetings this week, looking towards building on the success of the Fleadh. “What we have shown is that we can host large-scale events. Clare County Council put in a major investment with Irish Water by tapping into the main sewers around the town so that the facilities are all in place. So we are now open to business for large-scale events,” he said. As to what that event or events may be, Mr Cahir said “we are the authors of our own destiny but we are certainly going to make sure we find something that is suitable for the town”. He said businesses are eager to continue this momentum, by either establishing a new event or by growing some of the town’s existing ones. “Obviously we are the home of traditional music, so we are looking at whether there is anything we can do in that area. Certainly we have shown that the town can host it and the businesses now have the confidence to row in and get involved in larger scale festivals and events. We don’t need to be parochial any more, we can stand on the national stage and hold our head high,” he continued. Businesses are already discussing the possibilities for the Munster Fleadh next year and are even looking ahead to 2019. As Fleadh Cheoil na hÉireann 2017 draws to an end, Mr Cahir said the feedback from businesses this year is very good compared to last year. “The lessons that we learned have been heeded. The maintaining of the town being open has meant that all the businesses that may not be reliant on the Fleadh are certainly much happier this year. Customers do appear to be coming into town and offices appear to have clients coming in. Business is being done and the people are enjoying it,” he noted. He said the message this year has not been one of forewarning but rather one that is inviting. “There’s a lot more involvement by local people and they are making sure that they enjoy it as much as possible and that there is more buy-in from the rest of the county. It would appear that we have a lot more visitors this year early in the week. Certainly the place is vibrant and alive and it is locals mixing with the rest of the world,” he concluded.